Mumbai: The business process outsourcing (BPO) arm of Infosys Technologies Ltd will have a new chief executive by the end of January, said T.V. 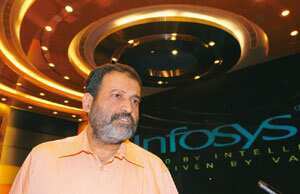 Mohandas Pai, director and head of human resources. Chaudhry’s abrupt departure was surprising. “He was a star. We wanted to keep him but he had a good opportunity and had made up his mind about it," Pai said. “Amitabh was instrumental in ramping up up our BPO business from $85 million (around Rs394 crore today) when he took over in 2006 to around $335 million now." Infosys employs 105,453 people including 16,500 in the BPO business, as of 30 September. As Infosys looks for a replacement, some analysts said that the exit at a time when the BPO arm of India’s second largest information technology services firm is just getting into an acquisition could have possible implications for the smooth integration of the new entity. Two weeks ago, Infosys BPO had announced its intention to buy McCamish Systems Llc, a US-based BPO firm that focuses on services to insurers. Infosys will make an upfront payment of $38 million, plus another $20 million linked to financial performance of the acquired entity. “The lack of a clear second in command is a cause for worry," said Nitin Padmanabhan, an analyst with Centrum Broking Private Ltd who tracks Infosys. However, Infosys’s Pai said that the firm had a clear leadership structure in place and that there were “some quite capable executives." He also said that the acquisition will go ahead as planned and that another person will step in to coordinate with McCamish management.